Culpepper Mullis was a young man of Berrien County before the Civil War. He was apparently somewhat of a rowdy and prone to riding while intoxicated. A son of Catherine and Thomas Mullis, he was born about 1834 in North Carolina but came with his parents and siblings to Georgia about 1841. Shortly thereafter his father died, when Culpepper was about nine years of age. In the census of 1850, Culpepper was enumerated in his widowed mother’s household, which at that time was in Lowndes County, GA.. In 1855 his mother married Blank Lee. Their place was apparently in the neighborhood of Milltown (now Lakeland) in that part of Berrien County which was later cut into Lanier County. Old monument to Culpepper Mullis. Tifton Gazette, Dec 7, 1864. There is a monument on the side of Mud Creek road, about one mile north of Milltown, which tells the passer-by of a very sad tragedy which occurred there before the war. 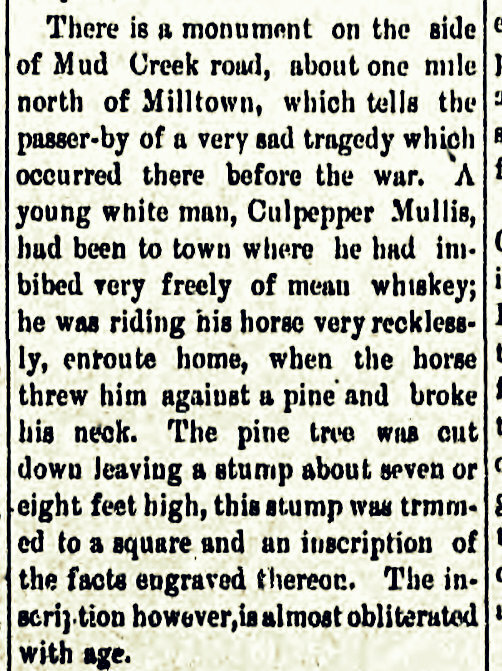 A young white man, Culpepper Mullis, had been to town where he had imbibed very freely of mean whiskey; he was riding his horse very recklessly, enroute home, when the horse threw him against a pine and broke his neck. The pine tree was cut down leaving a stump about seven or eight feet high, this stump was trimmed to a square and an inscription of the facts engraved thereon. The inscription however, is almost obliterated with age.